Select a location. While you like a bit of afternoon shade for your summer garden, you’ll want full sun now. If you’re using raised beds or large pots, clean out debris from previous gardens and add new garden soil. If you’re gardening in the ground, get your soil tested (see Garden Chores). Pick the vegetables and herbs that you and your family like to eat. Some popular cool-season vegetables are broccoli; cauliflower; Brussels sprouts; and garden peas, also called English peas; kohlrabi; and snow peas or other edible-pod peas. Transplants are available in most garden centers. Lettuces and other salad greens can also be purchased at nurseries, but they’re grown easily from seed. If you choose to sow seeds, sow a row or section every week to ensure a continuous crop. The same is true for heartier greens, such as collards, mustard, turnip and kale. If you’re new to gardening from seed, start with radishes, carrots and cool-season herbs such as parsley, sage, cilantro and dill. Follow the instructions on the seed packet. 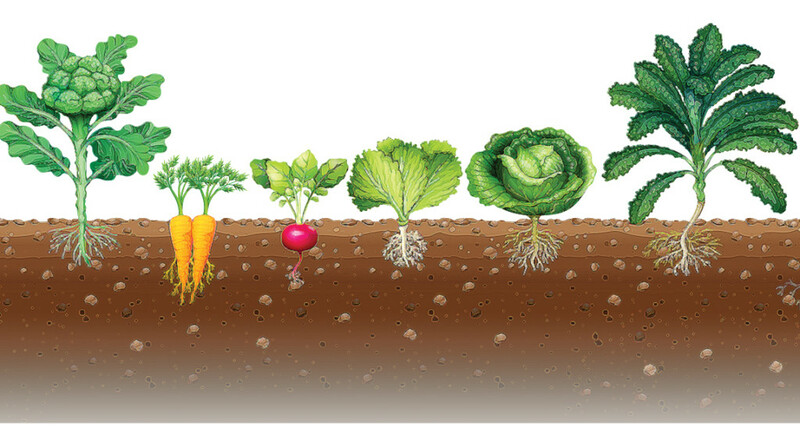 For radishes and carrots, make sure your soil is fine and loose so those edible roots can easily grow. Be prepared to cover your crop if a hard freeze is forecast. Most cool-season vegetables can take temperatures into the low 30s for an hour or two. In fact, collards taste better after they’ve been kissed by frost. How can something so cute be so darned destructive? Sciurus carolinensis, better known as the gray squirrel, will tear up your plantings to find food, to make holes to bury their purloined provisions and for fun. As humans continue to encroach on their wooded habitat, they remain savvy suburbanites. If you’re not going to eat them, don’t kill them. Simply outwit them: Wrap your flowering bulbs in a loose bundle made from chicken wire, which will protect them and give them room to multiply. Or plant your bulbs mixed with crushed gravel (bonus: improved drainage). Either way, don’t lay the bulbs on the ground as you prepare to plant; squirrels have a keen sense of smell, and you’re advertising the bulbs’ location. Sprinkle cayenne pepper on and around your plants; buy it in bulk in the Hispanic section of the grocery store. Put bird netting on your vegetable garden, berry plants and small fruit trees. Lay aluminum foil over the soil in your pots, poking holes for water to get through. Place birdfeeders at least 5 feet off the ground and 10 feet away from trees or other structures that squirrels can use as a launching pad. Grease your birdfeeder pole with oil or shortening. Or try feeding the squirrels on the other side of the yard. A well-fed squirrel just might be too fat and happy to get into mischief. Well, we hope so.